The King Solomon is a 600-fill power down sleeping bag designed to hold 2 people. Perfect for couples that want to sleep together in the same bag. Double wide, 72" length bag designed for two people. Available in regular length only. Built in pillow pockets hold a fleece or Big Agnes pillow. Features center no-draft flap. Fabric piece with Velcro closures on the center no-draft flap gives you the option to attach the top of the body of the bag to the center of the hood to eliminate more drafts when you move in your sleep. 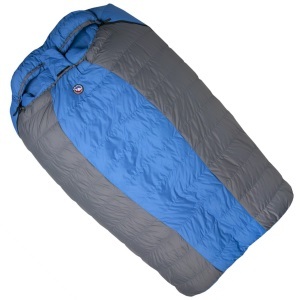 The Big Agnes System is a different design than the traditional sleeping bag lying on top of a sleeping pad. Instead, they join the two together. With the Big Agnes System, the pad slides into a sleeve on the bottom side of the bag and the top two-thirds of the bag is insulated like a traditional bag. When insulation material is compressed under your body it loses most of its ability to insulate. Big Agnes eliminates the underside insulation and replaces it with a sleeve to accommodate the pad which provides the insulation. This design provides a secure foundation so you stay on the pad all night. Other features include weight savings, reduced packed size, increased girth and comfort. Click here to see pads.